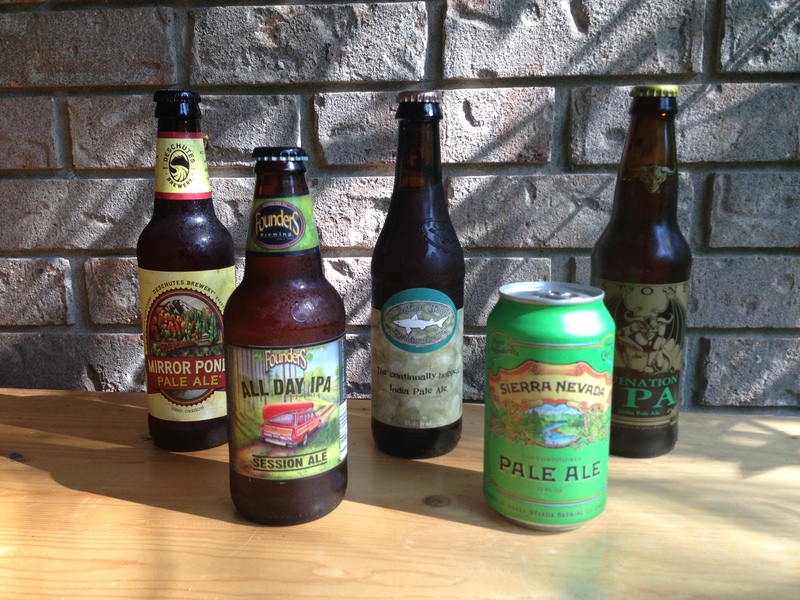 This is part seven in our series on American hoppy ales — American-style pale ale, American IPA and dIPA. The series began on July 28. These beers have all been dry hopped. The core of a beer’s bitterness comes from hops added in the boil. However, there are other times that hops can be added, although not all of them have much effect. There are three possibilities for adding hops prior to the boil — mash hopping, sparge water hopping and first wort hopping. Considered by the numbers, mash hopping is not very economical. In an infusion mash, the temperature of a mash is always going to be below the temperature at which alpha acids isomerize (185°F/85 °C). So, no bitterness will be extracted. Oils from the hops will be, however, and those that aren’t trapped in the grain bed will make it to the kettle. But, they will then be boiled for the entire length of the boil and mostly be lost. On the other hand, mash hopping does not add plant material to the kettle, so you might consider it for your hoppiest beers. In addition, hops added to the boiled decoction from a decoction mash would get boiled and yield some bitterness. Hopping your sparge water may add some bitterness to your beer. Alpha acid isomerization is more highly favored at higher pH values. [Hop extracts, for example, are made in high pH (~ pH 10) solutions.] Depending on the temperature of your sparge water and its pH, you may get some isomerization, even if your sparge water is below the temperature that alpha acids isomerize in wort (185 °F/85 °C at pH 5.0–5.2). As with mash hopping, some oils may end up in your wort as well. And hops in the sparge water won’t contribute plant material to the kettle. However, sparge water hopping is really only something to consider if you absolutely want to add hops at every point possible. First wort hopping is adding hops to your wort as it is running off, before it is brought to the boil. Some brewers claim the quality of the hop character you get from first wort hopping is better than that from an early kettle addition during the boil. This idea isn’t supported by data, however. One definite benefit of first wort hopping is that it greatly lowers the amount of foam produced when boiling commences, minimizing the risk of a boilover. You can hop wort after the boil in the whirlpool (discussed in the previous article) and using a hop back or hop jack. A hop back or hop jack is a vessel that lies between the kettle and the heat exchanger. (If you use an immersion chiller at home, you can’t use a hop back.) There are many different designs, especially at the homebrew scale, but all hold hops that are retained by a screen. Wort flows through the bed of hops and is filtered by it. In the process, hop oils are also added to the wort. (Some alpha acid isomerization can take place, as well.) Hop backs are a great way of getting one last blast of hop oils into your wort before it goes to the fermenter. Designed correctly, they are also a great way to filter the hot break and hop debris from your wort before it encounters the chiller. After a beer is fermented, you still have a few opportunities to adjust it’s hop character, particularly it’s aroma. Dry hopping is very popular with brewers making hoppy beers. In dry hopping, hops are added to the beer after fermentation. Over the course of several days — commonly 4 to 7 — hop oils are extracted and the hop aroma of the beer is enhanced. Unfortunately, dry hopping also leads to other plant compounds being extracted and frequently causes the beer to be cloudy. Many people new to brewing worry that dry hopping will lead to contamination of their beer. In practice, this doesn’t happen. The alcohol content of beer and low pH is enough to suppress the growth of microorganisms introduced into the beer with the hops. Dry hopping is something you can do immediately prior to consumption. Dogfish Head’s Randall — a vessel that filters carbonated beer through a bed of hops as it is being poured — adds further hop aroma to the beer at the last possible moment. Use your French press to make hop extract to be added in secondary or at bottling. For homebrewers, there is one last way to add some hop character to your beer after primary fermentation — with a hop extract made in a French press coffee maker. 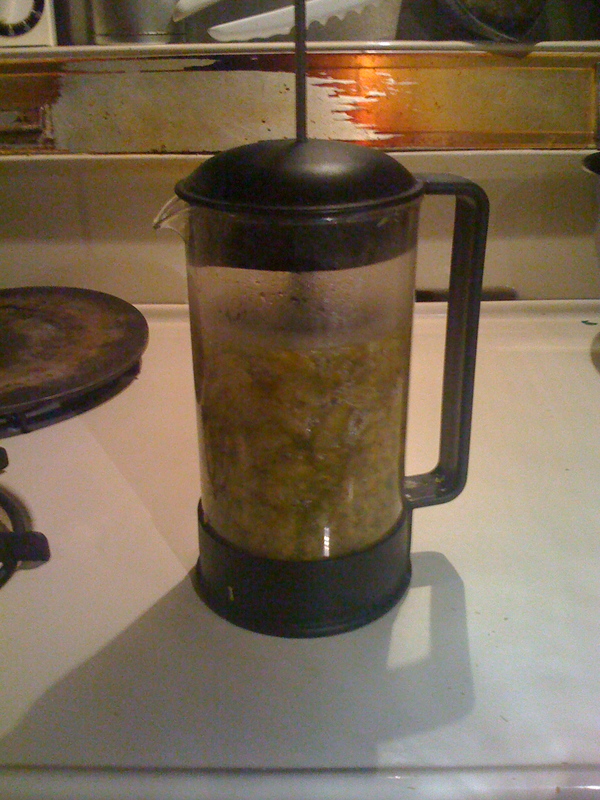 The idea is to boil some very dilute wort (SG < 1.020), add an ounce or two of hops to your French press and let them steep in the hot wort for 5–15 minutes. Then, press out the plant material, leaving a small volume of dilute wort with a small amount of bitterness and a fair amount of hop oils. (A 1-liter French press will yield about 660–750 mL of extract from 1.0 oz. (28 g) of whole hops.) This can be added to the beer as it is racked to secondary. Here the sugars in the wort will be consumed by the yeast, but this mild secondary fermentation is not enough to blow off the added hop oils. Perhaps the best time to add a French press hop extract is at bottling. Boil your priming sugar (or better yet swap the sugar for dried malt extract) and make a French press extract of hops. Add it to your bottling bucket and bottle. The hop oils in the extract will be trapped in the bottle and won’t be blown off by the refermentation of the added sugar. You need to add some liquid to your beer with the priming sugar anyway — when brewing a hoppy beer, why not have that liquid be full of hop oils? The American hoppy ale series will continue tomorrow with recommendations on hopping for APAs, IPAs and dIPAs, then conclude on Friday with a discussion of fermentation and conditioning. Damn, I thought I’d figured out every which way to cram hop oils in a beer. I’ve even hopped my Star San. But the hopped priming sugar idea sounds like money to me. Can’t wait to try it!